The SLAM (Saving Lives and More) team was in for a surprise when they took to the streets of Tilakwadi in an attempt to create awareness regarding traffic discipline on 17th Feb 2017. As the students and faculty of KLE College of Commerce, Jakkeri hond, went about the task of talking to people who violated rules, they were awestruck to discover how much cinema has been ingrained in the thoughts of people in town. On being stopped for not wearing a helmet, a gentleman got wild and accused his accusers of selective targeting. Right out of the books of the film Deewar came an outburst on the lines of “Pehle us aadmi ka sign like aao jisne mere Haath pe likh diya….”; he asked the members to go a first target the traffic police who were not doing their duty, the PWD for making bad roads, the corporators for taking bad decisions and so on and so forth. While one couldn’t agree less with the other complaints, the one thing that stood out was the sheer disregard for this individualistic suggestion of ours which called for people to look out for their own safety. The second case seemed to indicate that a complaint to the police would be of no avail since the person quite proudly defending his triple seated riding said, “Police se kaun darta hai? I have visited the police station several times so don’t try to scare me”. The third case was of a press reporter who said you cannot stop me because I am a press reporter and we are always in a hurry. Hence we do not wear helmets. You don’t understand our line of duty so don’t complain. The fourth case was of a girl claiming no concern or fear since her parents already knew of the fact that she is habituated to the deed of riding triple seated. The sad part was when the team encountered faculty members from schools and colleges without a helmet and other prominent people including law enforcers doing the same. An individual even exclaimed “Nothing happens. Only a few unlucky people die”. Quite a few bystanders also kept commenting that we were wasting time and nothing would come out of it. The filmy stunts were apparent when certain students with super powerful bikes sped past so that the SLAM members couldn’t stop them. The team has even heard instances of people claiming that their sons will not have any problems despite the underage riding because they themselves are well connected and will easily get their children free even if the traffic police manage to catch them. It is after all, just a matter of a phone call. While these experiences are going to be the largest challenge in this mission to instill some traffic sense if not common sense, the very fact that nearly 60 percent of the two wheeler riders violated rules is quite shocking. The dialogues will continue to be filmy since after all, films are just a reflection of what happens in daily life. While the SLAM team put in all efforts to convert arguments into conversations, the truth was laid bare. The journey ahead is and will always be riddled with challenges. 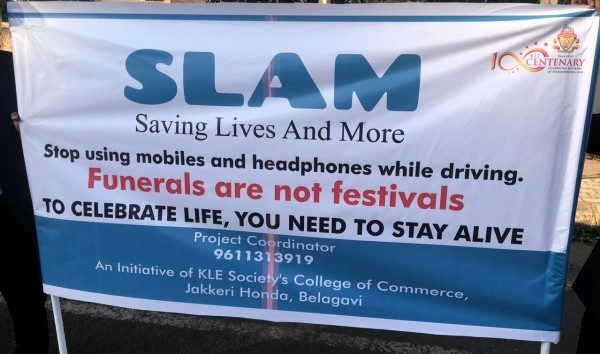 But I think we the people of Belagavi are not used to be told upon by our peers…I think if you set an example first by following the helmet and traffic laws yourselves might help. Preaching by setting an example! But I think we are not used to be told upon by our peers…I would suggest you make yourselves an example by following the helmet and other traffic laws first. Preaching by setting an example might work! Ignore the fools. You cannot do much about the kind of people flaunting their connections or ego. Keep up the good work, always there for good cause of work, once again great initiative. SLAM Team is doing a good social work. We should encourage and admire them. So please keep your valuable individual views aside and spare some time listening them.